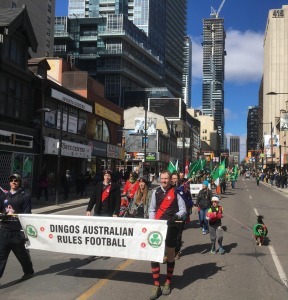 On Sunday March 11th, The Toronto Dingos marched in the St Patricks Day Parade for the third year in a row. Starting a week early, The Parade was attended by a large number of Torontoians who lined the route from Bloor, to Yonge and Queen street glad in green, white and gold. Maybe its the luck of the Irish but once again the Dingos marched in the sun in Club Colours while draped in Irish and Australian flags. A family event, the club was also represented by player's partners and children who basked in the unique experience of a stroll and a kick on the streets of downtown Toronto. 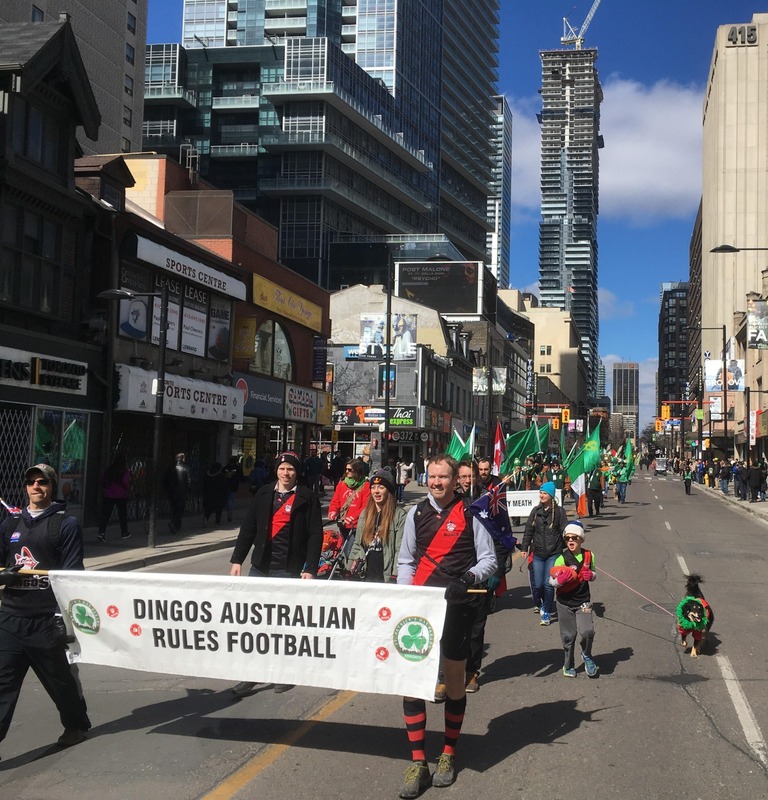 The parade route offered some excellent kicking space as some of Dingos, who wore the full playing uniform, dazzled the crowd with kicking and marking drills. What has become a tradition within a tradition, Irish man 'Gaz' perfectly converted a high kick over the Eaton Queen Street Bridge which was unfortunately spilled by Tim Indian. Coach Mike Karas was last seen struggling with his whiteboard to find a back pocket deep enough. St Patricks day was capped off with a visit to our downtown sponsor The Office Pub for some Paddys days beers.